This year, GlobeCasts Teleport and Master Control are receiving major enhancements and re-designs. This is being accomplished to assist increased business expansion and to offer even higher levels of service to clients. The Master Control is increasing in size by 100 percent to ensure GlobeCast Australia continues to reach the world. In fact, GlobeCast Australia in June processed its 100,000th booking in its electronic booking system, ScheduALL. Rapid growth in global demand for high-end content distribution has seen GlobeCast Australia quadruple its annual bookings volume for occasional use services  this is in addition to the Companys full time services growth. Key bookings clients include BSkyB, Sky New Zealand, Sky News Australia, FOXTEL, FOX Sports, Network Ten, the Seven Network, SBS, SportsBrand, and World Sports Group. GlobeCast Australia is the provider of choice to deliver ad hoc content to and from broadcasters throughout Australia, New Zealand, and the Pacific Islands. Clients need a reliable and cost efficient service, and the front line of this operation is a highly skilled Bookings department and a system that can be viewed by all key personnel. From its Sydney based Teleport, GlobeCast Australia offers global customers backhaul, uplink, downlink, encoding, multiplexing, encryption, time-delay, local play-out and insertion, 24/7 monitoring, IP monitoring, transcoding to 3G phones, and SMS Services. The facility draws together an international fiber and satellite network which presents attractive solutions. GlobeCast Australia has fully protected and diverse, self-healing, bidirectional STM-1 international fibers connecting Auckland, Sydney, Los Angeles, and London  all use SDH as the standard. They are configured to carry SD and HD, ASI and SDI, and all the equipment at either end is fully redundant, with no single point of failure throughout the system. The fibers have flexible bandwidth options and GlobeCast Australia offers multiple domestic and international downlinks for injection to its international fibers. The Company also operates dozens of full time digital and analog tails to major international switches and hubs; Sydney DVOC, LA Switch and Pac Bell Hub, and the BT Tower in London. For Australia and New Zealand, the Company operates one full FOXTEL-ready transponder on Optus C1. FOXTEL is Australias premier pay television operator. On the Optus D2 satellite, GlobeCast operates five transponders with 52 video channels and 27 MHz of flexible, occasional use bandwidth. The channels are a mix of ethnic, sport, religion, financial, and niche programming. On the PanGlobal platform, there are an additional 29 video channels on Intelsat 8 (IS-8), plus a range of Arabic, African, European, Asian, and niche foreign language channels. GlobeCast Australia also caters to Asia via full-time leased and operated 9MHz C-band SCPC on AsiaSat 2 for occasional use for distribution throughout Asia on the preferred Asian distribution satellite; and it has an impressive list of international downlinks in Sydney: AS-2, AS-3, AS-4, IS-5, IS-8, IS-701 and NSS-6. In Perth, it has a facility at Optus Lockeridge, which can downlink Thaicom 5 and IS-10. That allows GlobeCast to backhaul Direct to Home (DTH) channels and occasional use SD and HD bookings on capacity from Europe, Asia, and Africa. Content is then moved via a protected STM-1 connecting the Perth facility to the state-of-the-art, 24/7, master control teleport facility in Sydney. Many in the media industry are aware of GlobeCasts history in transmitting and distributing ethnic and other specific interest TV channels, such as Vision Asia and the Australian Christian Channel, both DTH and payTV platforms. With more than 120 video and audio services already delivered on a permanent basis, DTH services cater to a wide range of viewing tastes, including the multicultural communities of Australia as well as featuring major international channels, such as NHK. Optus D2 is an effective and economical satellite solution for channel operators, according to GlobeCast Australias DTH Manager Mr. Lobwein. The D-Series satellite has been developed by Optus to deliver the nexgen of digital satellite services to Australasia, with increased channel capacity and technical quality. Optus D2 is received in more than 350,000 dish-installed homes across Australia and New Zealand, and includes numerous free to air (FTA) channels. EURO World Network operates the Croatian package on the Optus D2 platform. We are very pleased to have signed with GlobeCast Australia. They are exactly the partner we had been looking for: efficient, reliable and open to new solutions. Thanks to them, we are able to broaden our offer to our subscribers, said EURO Worlds President and CEO Mr. Chris Williams. In recent years, the channel distribution has become even more mainstream with the addition of the likes of global sports net Setanta and Australasian racing channel, TVN. In addition, the DTH model is becoming increasingly versatile in the content it carries and the distribution locations. For example, TVN, in addition to being distributed to FOXTEL, is also delivered direct to 5,000 pubs and clubs across Australia. Transmissions over the past two years for 3G mobiles finds GlobeCast distributing international brand channels, such as Cartoon Network, Sky News Australia, Fox Sports, CNN, and BBC into new medias smaller screen environments. IPTV, and simultaneous broadband streaming, are an integral part of reaching audiences in 2009. The anywhere, anytime psyche that drives mobile and Internet distribution is clearly evident across all GlobeCast activities. GlobeCast Australia also multi channels and time-shifts in the digital environment for ABC and the Seven Network. The Company also provides significant international fiber capacity for content delivery to other leading FTA networks, including Network Ten and SBS. The company is regularly adding new marquee sports and events to its calendar of events, including the Indian Premier League in 2009. Uplinking and distribution of rugby league and motocross were new in 2008, joining major sports such as V8, thoroughbred horse racing, tennis Opens and rugby union internationals, to name but a few. Our sporting relationships, some direct with sporting organizations, also lead us to good relations with rights companies and agencies such as IMG, SportsBrand, and World Sports Group, Mr. Nealon stated. From this history of broadcast distribution, GlobeCast Australia also sees a new market developing  a more direct to venue than the original direct to home. Corporate clients and venues are in detailed planning stages for the installation of digital uplink and downlink infrastructure to assist in spreading messages to staff and to stage audio visual events in large audience environments. In particular, another breakthrough relates to communications in the workplace and to customers. Business TV solutions are about to be delivered for major clients in the Australian financial services sector, allowing them to better communicate internally and externally, enhancing their brand and sharing critical information quickly and with maximum impact. Its an obvious, natural and bespoke response to the increasingly fragmented and niche world of communications, according to the team at GlobeCast. As mentioned earlier, the increasing demand for channels, events, and broadcasters has led GlobeCast Australia to commit to significant upgrades of its Teleport and Master Control, according to the companys Director of Engineering Peter Booth. The Teleport is positioned on the roof of one of Sydneys iconic high rise buildings, the MLC Centre. The Teleport upgrade in 2009 increased power, installed larger amps on AS-2 to allow for four simultaneous uplinks, and resulted in higher quality, clean carriers. Also created were three discrete uplinks to the three D2 slots, something that is supplemented with Australias largest DSNG fleet of 10 vehicles and flyaways. The 69th floor satellite dish farm on the MLC Building is the second tallest address in Sydney and possibly the highest Teleport facility in the Southern hemisphere. GlobeCast Australia now offers 13 satellite dishes, ranging from 4.5m to smaller 2.0m antenna, five of which are uplinkable to domestic and international destinations as far away as Cyprus in the Mediterranean and Los Angeles in the U.S. Complementing GlobeCast Australias global fiber connectivity, this provides the bridge to key distribution markets throughout Asia, the Middle East and into Europe. Transmission dishes are permanently fixed to Intelsats IS-5 and IS-8, covering an area throughout the Pacific, Oceania, and South East Asia. Clients in this region enjoy world-class broadcast events on a regular basis, courtesy of GlobeCast Australia services. The English Premier League is a prime example and is viewed from the U.K. to Fiji with Globecast Australia providing the bridge with Intelsat. Another satellite providing crucial operational connectivity is Asiasats AS-2, soon to be upgraded to AS-5. The latter is a more powerful satellite that will cover the same AS-2 broadcast footprint, ranging from the Eastern fringe of Europe all the way to Australasia, with downlink capability throughout all regions in its path. This means traffic, both to and from Europe, can be transmitted via the MLC Teleport. The content can then be received in Hong Kong and Singapore, Malaysia, India, Dubai, Jordan, and Cyprus. These locales are all major connectivity hubs for onward fiber pass or instantaneous satellite turnaround. Such is particularly useful for European-only satellites and is highly effective to forward live international events out of Australia to viewers on the other side of the planet. 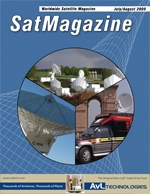 With AsiaSats decision to upgrade the spacecraft, Globecast Australia, as an owner of permanent capacity, undertook a calculated decision to increase uplink capability in readiness for seamless transition to AS-5 in late 2009. Globecast has increased its ability to transmit two 9MHz C-band channels from Sydney to a total of four 9MHz C-band channels. Ex-British Telecom Satnet Satellite Operations Manager and now the Teleport Engineer at Globecast Australia, Jonathan Garratt, says the company also decided to use Newtecs Azimuth range of modulators and combining upconverters to create a facility offering full flexibility and redundancy for any uplinking scenario that could be potentially requested. Single, dual, triple, or quad carrier operation at 9MHz can be individually driven from a purpose-built graphical interface at the MCR operations level. Any combination of these carriers or their committed sum bandwidth on satellite can be manipulated at the touch of an onscreen button to engage single or dual carrier operation for as much as 36MHz of HD level broadcasting. DVB-S2 modulation schemes and 8PSK are a crucial part of planning at Globecast Australia. The Master Control upgrade is ongoing as crucial infrastructure is carefully duplicated, transferred, and then re-integrated. The floor space is doubling in size and the number of monitoring screens is tripling. The design has created one large CAR rather than separate rooms, and created more rack space for now and for the future. For DTH, in its Master Control, GlobeCast Australia encodes statmux, scramble, and handoff (via protected DS-3) more than 100 video and audio services to Optus Belrose for uplink onto D2 and C1, in all a total of six platforms. One of the platforms is running on legacy Scientific Atlanta equipment, three platforms are on Thomson Vibe plus Broadmux (one of these is for the Foxtel ready platform onto C1), and a further two platforms running on Thomson Vibe are using the very latest Net Processor 9030 multiplexer. The created transport streams are passed to Belrose on DS3 equipment Network Adapter Units (NAU), as supplied by TANDBERG (TSP 6120). The scrambling system employed is Irdeto Pisys. The Master Control supplies a mixed bouquet to Hutchinson for reconstitution onto their 3G mobile phone network platform. A selection of TANDBERG and Scientific Atlanta decoders supply a SA DCM (Digital Content Manager). The multiplexed output is fed to Hutchinson via protected DVNs. GlobeCast Australias international fiber contribution and backhaul circuits are populated with equipment supplied by TANDBERG (Decoders/encoders), Thomson (Decoders/encoders), Scientific Atlanta (muxing), IRT and Ipitek (both for ASI over fiber delivery). The continued growth in all business areas including Contribution, DTH, and SNG services facilitates the need for more rack space and a larger Master Control, according to Broadcast Operations Manager Peter Doueihi. The planned expansion will include a completely new, state of the art, control desk complemented by a video wall increasing from 10 to 24 (Plasma/LCD) screens. Recent infrastructure enhancements in preparation for this expansion are already underway with the addition of a Chloride 120KVA UPS and increased capacity to the air handling. Once the build has been completed, in addition to the expanded MCR, GlobeCast Australia will have the footprint available to install an additional 30 equipment racks, already in demand from multiple clients. The central switching matrix is a Probel Sirius, while AXON standards converts are used to change between NTSC/PAL, and Playbox is used for ad insertion and crawlers. VIP MVP is employed for driving the monitoring displays, TANDBERG TT1260 and TT1290 are the decoders of choice, with TANDBERG 5700 and 5782 for SD and HD encoding, and TANDBERG SM6620 Modulators for uplinks. Pixelmetrix provides ASI delay units, while 360 Systems image servers are used for SDI delay and a Thomson Sapphire ASI recording device is used to top/tail clips. There are Vertex upconverters for the C- and Ku-band uplinks. In addition to the landmark occasional use Booking #100,000 achieved in June, the upgrades come after five years of general growth and innovation. The company conducted the entire level of 2004 business in just the first five months of 2009. GlobeCast Australias most recent establishment of infrastructure allows for seamless disaster recovery for key broadcast networks in Australasia. A secure, state of the art facility was custom built to satisfy the needs of clients.The company now also contracts for satellite tracking, as well.